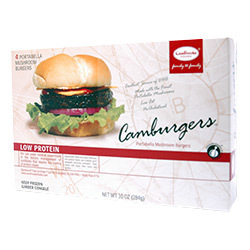 Description: Each carton contains 4 - 71 g low protein portabella mushroom burgers. These tasty char-broil flavored portabella mushroom burgers are easy to prepare, contain no cholesterol, no texturized vegetable (soy) protein and have only 2.5 g of fat per serving. Preparation: Pan fry, grill, or broil these delicious burgers. Frying with a small amount of cooking oil is the preferred preparation method. When grilling, it is recommended to partially cook burger before placing briefly on the grill. Stove Top/Griddle: Preheat a lightly oiled skillet or griddle over medium heat. Cook frozen patties for 3-4 minutes on each side. When grilling, it is recommended to partially cook burger in a skillet before putting on the grill. Serving Suggestions: Serve for lunch or dinner, on low protein bread or buns with your favorite condiments or as a main entree item with your favorite side dishes. Use as a substitute in your favorite meat recipe. Ingredients: Portabella mushrooms, wheat starch, psyllium fiber, modified cellulose, sugar, polydextrose, yeast, xanthan gum, soybean oil, salt, water, tomato concentrate, corn syrup, high fructose corn syrup, distilled vinegar, salt, onion powder, natural flavors, canola oil, dextrose, maltodextrin, natural grill flavors, (maltodextrin, natural flavors, modified food starch, corn syrup solids), garlic powder, onion powder, spice, natural mesquite smoke flavor, spice extract, silicon dioxide (to prevent caking), potato starch, sago starch, modified food starch, xanthan gum, DHA algal oil (high oleic sunflower oil, sunflower lecithin, tocopherols and ascorbyl palmitate [as antioxidants]), calcium propionate (preservative). Contains soy and wheat. From Liz Moore of Monroeville, Pennsylvania on 2/28/2014 . Great taste! Perfect for bbqs! From Anonymous of Franklinville, New Jersey on 11/4/2012 . Great for little ones too! From Jack&#39;s Mommy of Brentwood, Tennessee on 1/8/2008 . From Anonymous of Salt Lake City, Utah on 3/4/2007 . From Anonymous of salem, New Hampshire on 1/9/2007 . 2/12/2010 – Would the Camburgers turn out okay if they were cooked in the microwave? I love the Camburgers, but I am living in a dorm . . .
9/26/2006 – Do you have lysine inforamation available on your productos? 9/19/2006 – When will the Camburgers be available?